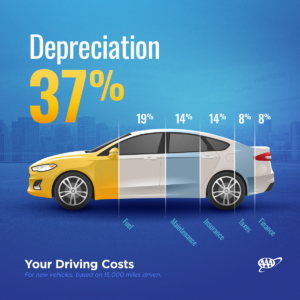 TOPEKA – AAA’s 2018 Your Driving Costs study reveals the largest expense associated with purchasing a new car is something many drivers fail to consider – depreciation. In fact, it accounts for almost 40 percent of the cost of owning a new vehicle – more than $3,000 per year – and is influenced by a number of factors, including shifting consumer preferences. AAA urges car buyers to think about both market trends and length of ownership when shopping for their next vehicle purchase. Buyers often only give priority to purchase price and monthly payment when choosing a new car, sometimes selecting a vehicle based on the best deal available. The length of car ownership, however, is of equal importance. Consumers who plan to keep a vehicle for only a few years should be cautious of deep discounts and incentives offered by automakers and dealers. These are often designed to sell less popular models and directly influence depreciation. Low down payments and extended finance terms can also have a similar effect. Stretching a car loan over five, six or even seven years may be an effective way to lower payments, but owners may quickly find themselves owing more than the vehicle is worth. Show your car some love – It sounds counter-intuitive, but spending money on routine maintenance can actually save you money in the end. To keep engines running cleaner and longer, consider switching to synthetic oil and upgrading to a higher quality fuel TOP TIER™ gasoline.